Dance at le Moulin de la Galette is also known as Bal du moulin de la Galette and it is hailed as one of Renoir's most important works of the mid 1870s. The Moulin de la Galette was an open-air dancehall and café that was frequented by many artists living in Paris. Renoir attended Sunday afternoon dances and enjoyed watching the happy couples. For him, it provided the perfect setting for a painting. Most of the figures featured in Dance at le Moulin de la Galette were Renoir's friends, but he also used a few professional models. Thus, it can be said that the scene he depicts is not a realistic representation of the Moulin's clientele, but rather an organized set of portraits. This painting was first shown at the Impressionist exhibition of 1877 and demonstrated the original technique developed by Renoir. This canvas shows Renoir's friends, Frank Lamy, Norbert Goeneutte, and Georges Rivière gathered around the central table. Rivière, a writer who knew Renoir well at this time, wrote a review of Dance at le Moulin de la Galette in the journal L'Iimpressionniste which accompanied its exhibition. The writer referred to Dance at le Moulin de la Galette as a "page of history, a precious and strictly accurate portrayal of Parisian life. " Yet, others were not so kind. Many contemporary critics regarded this canvas as merely a blurred impression of the scene. Known for his pleasant paintings, Dance at le Moulin de la Galette is regarded as one of the happiest compositions in Renoir's oeuvre. Today, it is on display at the Musee d'Orsay in Paris and is one the most celebrated works in the history of Impressionism.
" Shall I tell you what I think are the two qualities of a work of art? First, it must be indescribable, and second, it must be inimitable." Renoir was an artist famed for creating joyful paintings that were essentially snapshots of real life, and captured the true spirit of particular scenes. Dance at le Moulin de la Galette was a great example of this. Dance scenes were among Renoirs favorites as they were full of people enjoying themselves. The Moulin de la Galette was one café that the Renoir frequented as it was close to his home and it provided a great theme for his work. Much of Renoirs early work was inspired by his peers and other artists. In 1869 Renoir worked very closely with Monet and both were focused on painting light and water. It was during this time that they developed the technique that became central to Impressionism. They discovered that shadows are not brown or black but are colored by the objects around them, and that the 'local color' of objects is modified by the light and reflections of surrounding objects. At this time, the styles of Renoir and Monet were almost identical but in the 1870s they explored their own methods and worked alone more frequently. As well as similarities to Monets works, Dance at le Moulin de la Galette shows influences from a range of other artists. 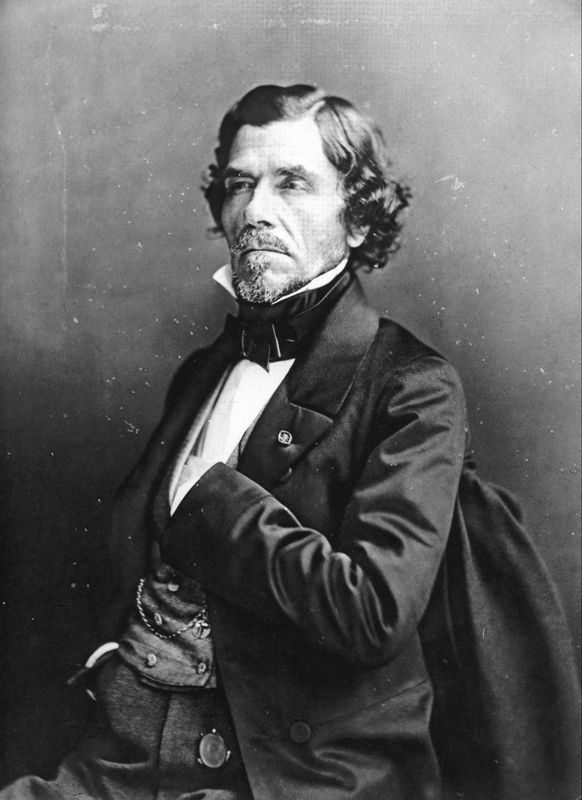 In his early career Renoir was greatly inspired by the artistry of Eugene Delacroix, a fellow French man whose work typified 19th-century romanticism. Renoir and the other impressionists were also greatly influenced by Delacroixs technique, which saw him use contrasting colors with small brushstrokes to produce a very vivid effect. Dance at le Moulin de la Galette also emulates the luminosity of Camille Corot. Corot was a key figure in landscape painting and his works referenced Neo-classicalism as well as anticipating the plein-air modernism of Impressionism. Additionally, Renoir admired the realism of Gustave Courbet and Édouard Manet. He was also a great admirer of Degas perception of movement. Like many of Renoir's early paintings, Dance at le Moulin de la Galette is a snapshot of real life and it captures true Parisian culture. However, this canvas was unique because of its size. It was Renoir's most ambitious figure painting and no artist before him had created a canvas capturing an aspect of daily life of this magnitude. Like Manet did in La Musique aux Tuileries, Renoir included a number of portraits in Dance at le Moulin de la Galette and the majority of portraits were his friends. By cutting off figures in the piece, Renoir suggests that the scene continued beyond the frame. It seems that his time spent painting plein-air landscapes at Argenteuil prompted him use human beings, especially women, as the focus of this canvas. Renoir uses brightly colored brushstrokes to add movement to the figures as well as depth to this piece. Renoir bathes the figures in sun and shadow, breaking up the composition with patches of light and capturing the vibrancy of the scene. He blends colors that worked well for him and this results in a painting that is rich in form and with a fluidity of brush stroke. This innovative style and the grand scale of Dance at le Moulin de la Galette is a sign of Renoir's artistic drive. Renoir uses brightly colored brush strokes and opts to blend colors that suit him best. His refusal to use black together with the absence of outlines are traditional Impressionist techniques. Renoir uses patches of soft color and combines this with vibrantly colored figures, to give the impression of speckled light beaming through the trees. He creates the patches of light with soft pinks and purples, while for the figures he uses bolder shades of blue, red, and green for the clothing. 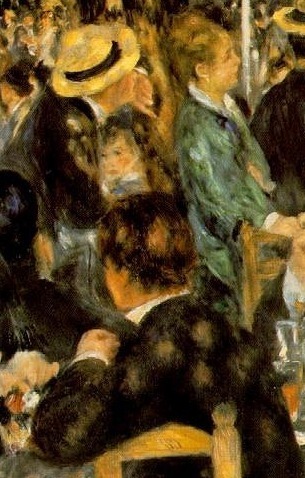 Renoir's use of light in Dance at le Moulin de la Galette as well as its sketchiness is typically Impressionistic. He bathes the figures in both sun and shadow and spots of natural and artificial light divide the composition and depict the vibrancy of the scene. The sunlight contrasts well with the dark clothing, and Renoir's bright brushstrokes add movement to the painting. Sunlight filtering through the trees gives Dance at le Moulin de la Galette a cheerful and summery feel as well as a sense of immediacy. Renoir reveals his true talent in this picture. It is a major composition that links the art of collective portrait, still life, and landscape painting. 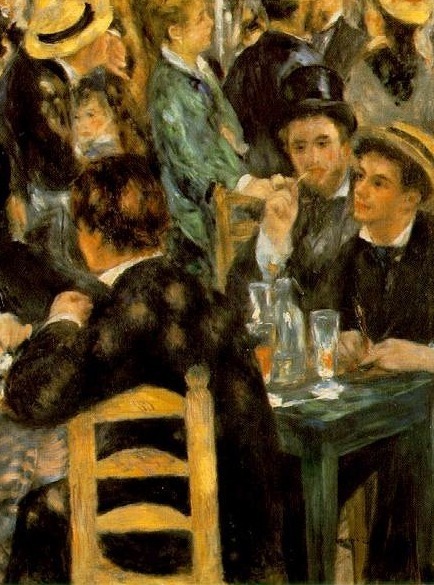 A founder of the Impressionist movement, Renoirs work received a great deal of criticism and Dance at le Moulin de la Galette was no exception, drawing mixed reactions from viewers. However, today it is one of the most celebrated works from the Impressionist period. While many critics praised Renoirs technique of fluid brush strokes and flickered light, others felt that this canvas was a somewhat blurred impression of the scene. Like many of his paintings, Dance at le Moulin de la Galettes use of light created a sense of vitality which did not obey the rules of the Salon. Focusing on classical rather than contemporary styles, the Salon did not appreciate dance halls depiction such as this. However, Georges Rivière, a writer and good friend of Renoirs at this time, who features in the painting, write a review of Dance at le Moulin de la Galettes in the journal L'Iimpressionniste which accompanied exhibition. He described it as a "page of history, a precious and strictly accurate portrayal of Parisian life". This canvas captures the spirit of this scene with joyfulness and passion and some critics argue that this is the greatest illustration of Montmartre and Paris. However one critic, Januszczak feels that this is far from a happy painting. Januszczak questions the females expressions and claims they do not portray joy at dancing with the men. It could be that drawing frowning lips and dark eyes was a way for Renoir to express his negative feelings about the women. This was also the case with other paintings carrying the dance theme, such as Dance in the City. Dance at le Moulin de la Galette was a depiction of one of Renoirs favorite subjects - entertainment - and it was clear that he took great pleasure in painting dance halls, concerts and cafes. According to some, such enthusiasm makes him the most accessible and adored painter in the world. A popular spot for artists and writers, the Moulin de la Galette was the subject of many paintings during the 19th and early 20th century. Like Renoir, artists such as Picasso and Van Gogh were keen to capture its ambience and joyfulness, though each canvas differs from the next. Below are examples of other works focused on the Moulin de la Galette. Along with Cezanne, Van Gogh, and Gauguin, Toulouse-Lautrec is regarded as one of the greatest painters from the Post-Impressionist period. Like Renoir, Toulouse-Lautrec was attracted to Montmartre for its somewhat retro feel and its popularity among fellow artists. 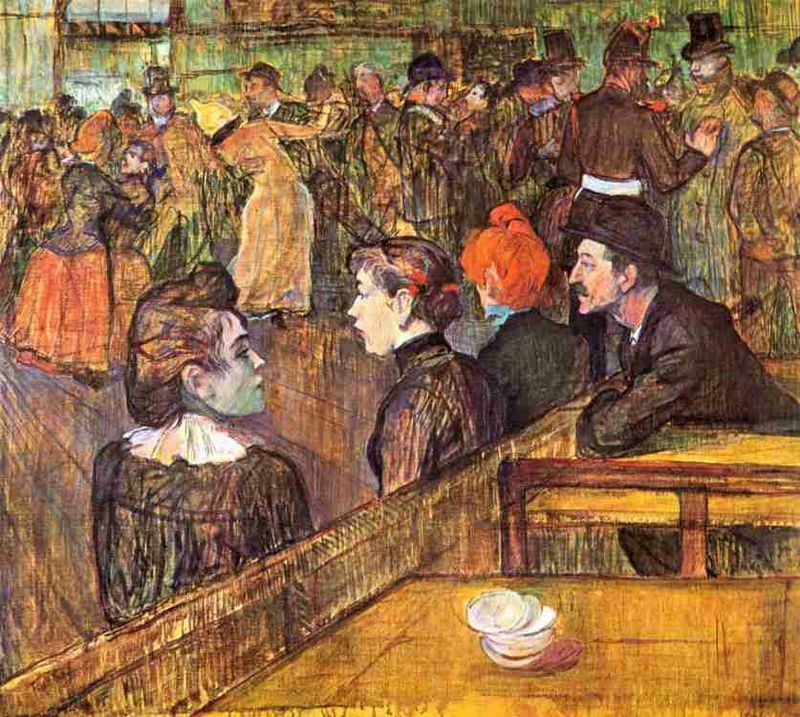 Toulouse-Lautrec painted the Moulin de la Galette thirteen years after Renoir, but adopted the same angle; people sitting at tables and socializing while couples enjoy the music and dancing in the background. In contrast to Renoir's sunny painting, Toulouse-Lautrec uses darker colors and focuses on being inside by using browns and grays. Toulouse-Lautrec's painting is also different from Renoir's because it does not focus on the faces of the people whereas Renoir painted almost every figure looking directly at the viewer. Thus, this gives the feeling of Renoir's work being more staged. Van Gogh completed this painting in 1886 whilst living with his brother in an apartment in Montmartre. Painting outdoors encouraged him to explore the effects of natural light and the result is a luminous palette that departs from his usual subjects of somber tones. Picasso created Le Moulin de la Galette in 1900. In it he paid tribute to French artists such as Toulouse-Lautrec and Steinlen as well as his Catalan compatriot Ramon Casas. Picasso's depiction of lamps burning in darkness and women wearing lipstick portrayed a very different ambience and created a more mysterious canvas than Renoir's. Picasso used more fashionable outfits too. However, like Renoir's creation some 14 years earlier, Picasso's work resembles a stage performance and his figures looked posed. Furthermore, the people in Picasso's canvas are also looking to the viewer. It seems that both Picasso and Renoir cared about the identities of those they painted. Van Dongen was a resident of the Bateau-Lavoir in Montmartre and this district became the subject of a number of his works. Picasso also lived there and with a studio next to Van Dongen, the two became firm friends. Van Dongen experimented with his art and his work was seen as moving towards a form of Expressionism. His scene at the Moulin de la Galette was, according to some, giving way to portraits. Renoir painted landscapes, portraits, still life, and modern life. He experimented with new methods throughout his career and dedicated his life to his art. He was the first Impressionist to break away from the movement's ultramodern direction, yet many feel Renoir remained the purest of all the Impressionist painters throughout his career. He made several thousand paintings and their sensuality made his works some of the most famous and frequently-reproduced in the history of art. Dance at le Moulin de la Galette depicted one of Renoir´s favorite subjects - entertainment - and today it is regarded as one of the greatest early paintings of the Impressionist movement. Renoir, together with his classmates Monet, Sisley, and Bazille established the Impressionist movement. Taking art in a new direction, these young artists experimented with new techniques and were considered radicals of their time because they broke the rules of traditional forms of painting, and worked outside of the studio. Although Impressionism in France began when several other painters were experimenting with plein-air painting, Renoir and his peers developed new techniques that defined the movement; their art was immediate, and it portrayed movement with sincere compositions and vivid colors. Rejected by the Salon, they displayed their works in private exhibitions and gained support for their distinct, modern paintings. Their works were easily identifiable by their use of bright colors, visible brush strokes, and emphasis on light. Their style depicted subjects and landscapes naturally. The public welcomed this original vision although art critics did not. The emergence of Impressionism inspired many other artists of the time and throughout the 19th century and led the way for a variety of other movements, including Neo-impressionism, Post-impressionism, Fauvism, and Cubism. 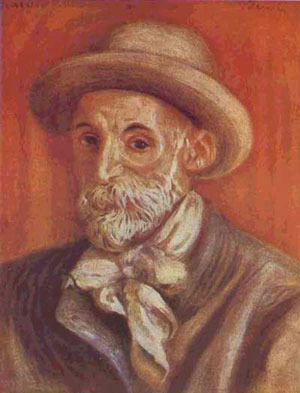 Many books have been written about Renoir and this famous painting. Below are a bibliography and a selection of recommended works about this fascinating art genre and one of its leading figures.